Charis Books and More in Little Five Points. The location will be moving to the Agnes Scott College Campus in early 2019. Charis Books and More was established in Georgia since 1974. We Need Diverse Books named co-owner Sara Luce Look the 2017 Bookseller of the Year. 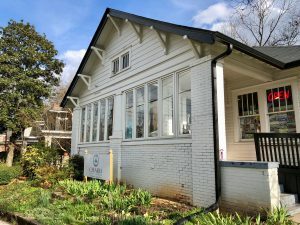 Charis is the South’s oldest independent feminist bookstore and specializes in diverse and unique children’s books, feminist and cultural studies books and Lesbian, Gay, Bisexual, Transgender, and Queer fiction and non-fiction. Founder Linday Bryant’s fascinating and inspirational history of Charis Books. I knew from the beginning that the dream of a bookstore was a vision and that developing that vision was my calling, my purpose. When we looked for a name for our bookstore, I found the word Charis in a Greek lexicon at Columbia Seminary where I’d gone to volunteer in their bookstore to learn something about retail bookselling that summer. “Charis” means grace or gift or thanks and Barbara and I knew immediately that it was the right name for our bookstore. Sara Luce Look: I checked out biographies of Johnny Appleseed and Marian Anderson from my local library repeatedly as a child. I I re-read The Bell Jar by Sylvia Plath as a teenager. And fell in love with Dorothy Allison’s writing as an adult. Origin story of your book store and you in it? 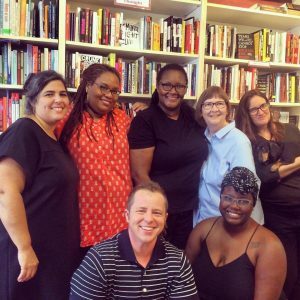 Charis Books & More was founded in 1974 and grew into a feminist bookstore by the early 1980’s. I was a women’s studies intern from Emory in 1991. I started full-time in 1994 and became a co-owner in 1998. I grew into myself at Charis. In 1996 we started the non-profit, The Charis Circle. 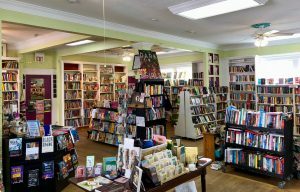 Charis Circle is the non-profit programming arm of Charis Books and More, the South’s oldest independent feminist bookstore. Charis Circle exists to foster sustainable feminist communities, work for social justice, and encourage the expression of diverse and marginalized voices. I don’t believe in one-size-fits-all mandatory reading. I always want to know what someone already likes and go from there…and I always recommend reading the introduction to Home Girls: A Black Feminist Anthology by Barbara Smith as a great place to start when you want to know more about “intersectionality “. The one thing you wish you’d known about the indie bookstore life? Jane Eyre. I read the Cliff Notes. How can an author read at your store? Jasmine the miniature dachshund comes to work daily. I’m surrounded by books to buy, so I’m not very impulsive…but it would probably be a cookbook.